Dark jackets weren’t compulsory! L-R: Ed Hammond of Panini, Matt Stokes of Ginger Monkeys, and yours truly. his week I was kindly invited to participate as a panel member in a Q&A session about ‘Getting into Graphic Art’ held at Tunbridge Wells Museum. Lead by Jeremy Kimmel, the museum’s Audience Development Manager, the panel consisted of Panini’s Comic Editor, Ed Hammond; designer and illustrator Matt Stokes of design agency Gingermonkeys, and finally, me, representing the educational perspective. 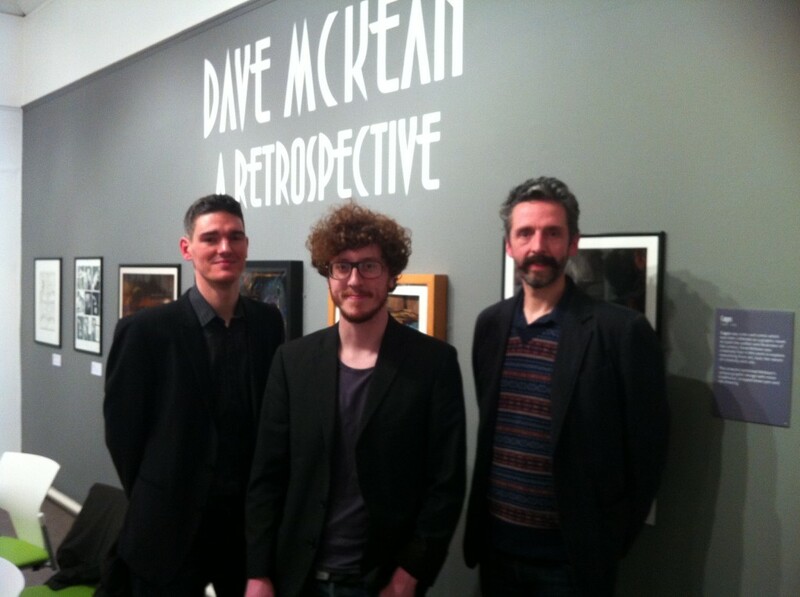 The discussion was held in the gallery space which is currently displaying an impressive retrospective of Dave McKean whose oeuvre includes film making, music and of course, graphic art. The talk maintained a lively pace throughout and covered many topics such as copyright, the growth of graphic novels, approaches to comic design, whether or not comics are an art form, and how the graphic novels differ from media such as books or film. I found the latter theme really interesting, with Matt mentioning that graphic novels are perhaps something of a “sweet spot” between the written word and film. I would agree. Though parts of the story are presented to you, the power of imagination is still required to form voices in your mind, and as as Ed added, it is your imagination that decides what’s happening between panels. Ed gave an interesting insight into the development of the production of comics, and talked the audience through the processes such as the Marvel Method. There was a lengthy discussion that centered around copyright and how budding artists can confidently self promote whilst simultaneously protecting their work and ideas. In response Matt and I discussed organisations such as the Association of Illustrators who provide good information about this and other professional matters. We concluded the talk discussing a rather big question, that of whether or not comics and or graphic novels (perhaps we need to differentiate?) are art. Does the framing of McKean’s work—much of which was made for graphic novels—have a different or greater cultural value when viewed in a different context, being framed and hung as works of art in an exhibition space? Either sits comfortably with me and I would perhaps argue that it really doesn’t matter. However, sadly it was said that there were those within Tunbridge Wells who objected to an exhibition of Graphic Art. I mentioned that graphic art was often looked down upon by some who see it as a poor cousin of ‘fine’ art. Both have their price; there’s a commercial value to both, but interestingly there’s a cultural value and common perception attached to both too. I mentioned that it was the one art form that as a design student in the late 80s we were very much discouraged from pursuing. This was not always because it was seen as non profitable, but because of a snobbery. When I mentioned this, a young member of the audience said that this was still something he was encountering. I found that slightly disheartening. The panel we’re obviously more encouraging. I mentioned that in terms of of graphic art being taken seriously, we’re seeing graphic novels win prestigious book awards, and organisations such the BBC and The Guardian use this graphic/comics journalism as a legitimate means of reportage. This is something that I discussed in a recent post. It was a great evening and I was very pleased to meet some nice people, including Chris Burke, an illustrator whose worked I’ve liked since I was a student. Hopefully the people of Tunbridge Wells will see the exhibition, and similar ones, as something that will attract a wider audience to their public spaces and in turn raise the cultural profile of the town. I for one would like to say well done Tunbridge Wells Museum— a job well done. I very much look forward to sitting in on the next talk which looks at Women in Comics.